The funeral ceremony for the late Prof. Festus Iyayi began on Wednesday in Benin, Edo State capital, with a solidarity march by members of the Academic Staff Union of Universities and civil society groups. Members of ASUU in their hundreds from other universities including the University of Ilorin, Ambrose Alli University, Ekpoma, Delta State University, Abraka joined their colleagues in the University of Benin to pay their last respect to the late Iyayi. Other groups represented included the Nigeria Labour Congress, Conference of Non-Governmental Organisations, Joint Action Front and Parents Consultative Association of Nigerian Universities. The march, which began at about 10am, included five kilometres walk to the residence of the late professor of Business Administration, on Bello Street, off Benin Lagos Expressway. Addressing the participants in the march at the residence of late Iyayi, the Chairman of UNIBEN chapter of ASUU, Dr. Tony Monye-Emina, described the deceased as one of the country’s number one fallen heroes and a hero of ASUU struggles. Monye-Emina said the march was the beginning of activities to mark the exit of the late professor. Also addressing the crowd, human rights lawyer, Mr. Femi Falana (SAN), urged ASUU not to relent in the struggle but to continue where Iyayi stopped. He vowed to ensure that recklessness on the roads by government officials was brought to an end. He said that ASUU and the Iyayi family members had mandated him to challenge the “murder” of Iyayi in court. He said the only way to ensure that what Iyayi fought for was not allowed to die with him was by sustaining the struggle. Other speakers eulogised Iyayi, saying he had actually been immortalised. Iyayi’s eldest son, Ehidiamen, who received the mourners on behalf of the family, thanked them for the support they had given the family since their father’s demise. He was later presented with a signed copy of the condolence register opened by the union. Meanwhile, ASUU chapter in Tai Solarin University of Education, Ijebu-Ode, held a candle-light procession in honour of the deceased on Wednesday morning. Participants at the procession sang solidarity songs during a 25-minute walk within the university campus as a mark of respect for the deceased. Chairman of the TASUED branch of ASUU, Dr. Adebayo Akinsanya, described the late scholar’s death as painful. “His death has really left a vacuum in the academic circle and we are going to miss him a lot. We organised this procession in honour of our late past president and to bid him good night with the hope of meeting him in heaven,” Adesanya said. He noted that Iyayi lost his life in the course of the struggle for the lecturers’ wellbeing, adding that he would always be remembered for his selfless service to mankind. “Iyayi believed in the freedom of the people and we at TASUED will continue to fight until we are sure that his efforts were not in vain,” he added. 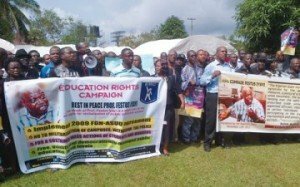 On the ongoing ASUU strike, Akinsanya said that the union would call off the strike once it was sure that the Federal Government had met the lecturers’ demands. “We are fighting this cause for posterity and for the future of education in this country; we are confident that we will win,” he said.